If you remember, French firm Audio Aero of Toulouse achieved fame if not fortunes during the 1990s for their CD players like the Capitole Reference and Classic, later the highly acclaimed LaFontaine and LaSource. All of those should still ring bells. Even though the company no longer exists, certain music lovers—I know a few—still hang on to these components and wouldn’t dream of replacing them; not for misplaced nostalgia but ongoing performance. It was a sad day when news broke that Audio Aero was out of business. Fortunately it didn’t take too long before we learnt that another French company out of Lyon had acquired Audio Aero by late 2014. Users of LaFontaine and LaSource were happy because the new company took over service of their machines. Others who’d missed out on buying one of those outstanding digital sources suddenly had their second chance. 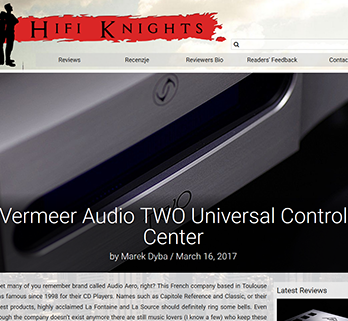 Obviously Vermeer Audio no longer sell/make La Fontaine or La Source but instead, use Audio Aero’s IP as platform from which to continue their own development. Their first model is the Vermeer Audio TWO. There are two more models coming in the near future – the top-line ONE and the entry-level THREE. Vermeer Audio now owns the technology of the most famous models of the prestigious company Audio Aero.